Farm Fresh Eggs – CSA starting July 25th!! Eggs are a wonderful source of nutritious protein, but most of the eggs you find at the grocery store come from sickly chickens. Anytime you are consuming animal products you must consider the health of the animal. The healthiest chickens are those running around in the pasture eating bugs and grubs as they are supposed to. Have you ever had a fresh egg from a healthy chicken? 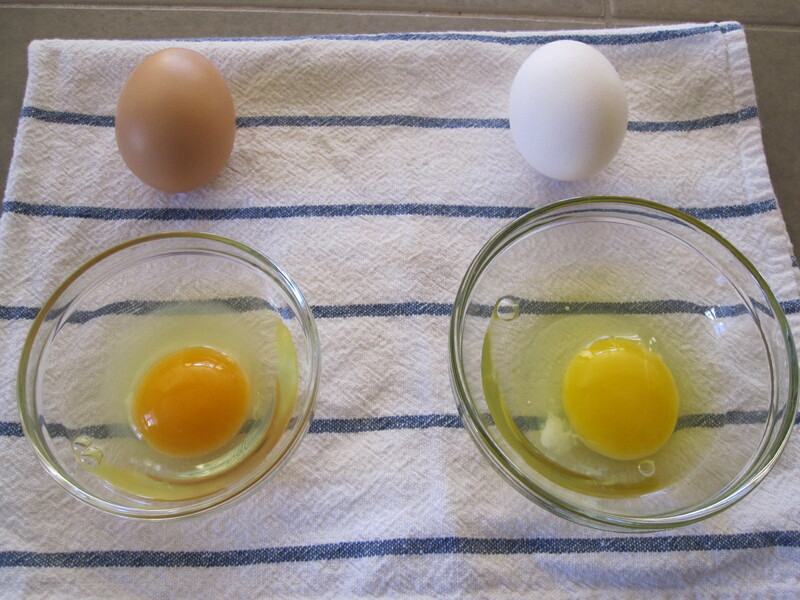 You will notice a big difference in the color of the yolk (where you find most of the nutrition in eggs). Healthy chicken eggs have a deep yellow/orange color. The commercial egg yolks from your local grocery are a sickly pale yellow color – devoid of nutrients. We have a source for pasture raised eggs at Rooster Hill Farm and have agreed to be a pick-up location for eggs for you. We have visited the farm and seen the chickens and are impressed with their operation. The hens that live at Rooster Hill Farms in China Grove are on pasture 365 days every year. We open the barn doors every morning after sunrise and the hens flood out into the pasture where they forage for bugs, worms and berries (which add anti-oxidants to the eggs) all day long. As the sun begins to set they wander back to the barns to roost. After sunset we close the barn doors to keep the hens safe from predators at night. We hand-gather eggs every day from the nesting boxes and package them for sale. Not a single egg from Rooster Hill Farms is ever more than a week old. Now THAT’s fresh! Buying from local farmers helps support your local economy. Produce from many national chain stores who claim to provide local produce actually truck in their produce from all over the country. Though it benefits the national economy, it does very little to help the local economy. Ask yourself this: how fresh can that produce be if it’s been taken on a long truck ride all over the country? Ask your grocer where their “local” produce was grown. You might be surprised! WHY BUY THROUGH A CSA? Over the last 20 years, Community Supported Agriculture (CSA) has become a popular way for consumers to buy local food directly from a local farmer. Here are the basics: a farmer offers a certain number of “shares” to the public. Typically the share consists of a set amount of produce (in this case eggs) each week for a set period of time. Interested consumers purchase a “share” for a set amount and in return receive produce each week. Now you can purchase ultra-fresh eggs directly from the farm. Determine the number of eggs your family consumes each week and subscribe for that number of “shares” for your family. Subscriptions are set on a Three-month “season”. The eggs will be delivered to our Matthews office weekly on Wednesdays and available for pick-up after 3pm. They must be picked-up no later than noon on Friday. The eggs will come un-refrigerated and will not be refrigerated at our office. See below for why. If you would like to reserve a dozen or more of these super healthy eggs – contact Debby Smith: debby@carolinasnaturalhealth.com or 704-771-8055. Is it necessary to refrigerate your eggs? Yes, and no. If you buy your eggs from the grocery store it is imperative that you refrigerate them. To make the eggs more aesthetically pleasing, the factory farms wash off the antibiotic coating put on the egg by the hen when she laid them. NOW they are susceptible to germs. However, if your eggs come directly from a farm they have not been washed (or graded or candled); the antibiotic coating is still on the egg. AND…most importantly, all of the enzymes in the egg are still in tact. One enzyme in particular, Trypsin lowers cholesterol. If the egg falls below 50 degrees the Trypsin dies and the net result is more cholesterol. Trypsin remains in tact in your eggs for about 14 days. Eggs left out at room temperature are safe to eat for 3 weeks or more. Disclaimer: Let me be VERY CLEAR about this. The law requires you to refrigerate your eggs! The law requires me to refrigerate eggs before I can sell them. It is not about health…it is about the law. The health department must follow the law, regardless of what is healthier. Hey mike. Sign us up for one dozen per week. We are in CA right now. Thanks. Thanks for all the info, though it is incredibly hard to find anything but store purchased eggs in the big city. I love all the information you gave here about eggs, especially about should they be refrigerated and what the law requires. And I think it is a real shame it is about the law, not about health. Thanks so much!